We are TEAM JP... Join us! 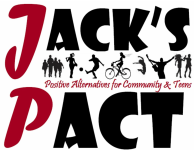 Thanks to dozens of youth and adult volunteers that make up "Team JP" by signing the PACT, we operate several successful initiatives each year (some listed below) to promote healthy lifestyles and advocate against drunk/drugged driving. We could not do it without the collaboration & dedication of many caring folks! If you would like to get involved and become part of our team, just let us know by clicking here to send us a quick note or check out our Events Calendar to see what upcoming activities you would like to participate in.